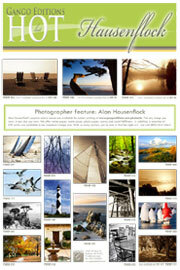 This month we feature one of our most popular photographers: Alan Hausenflock. Hausenflock’s beautiful boat, water, and sunset scenes are sure to turn heads. Every image in our extensive photography library can be printed on an array of papers and canvases at the size you need it. Visit www.gangoeditions.com/photosite to see the full selection of images or download our new Hausenflock Hot List today. Keep coming back to the Design Lab for more hot themes!